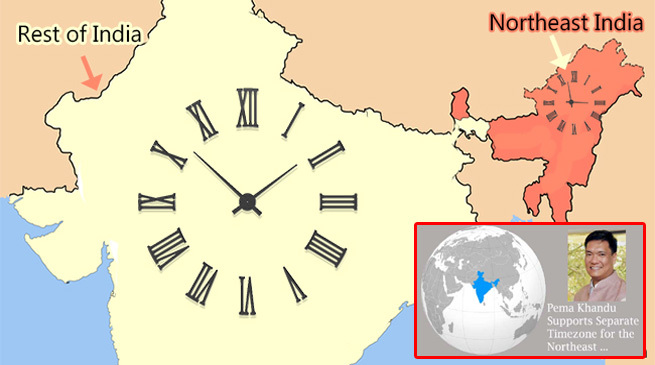 Recently, Arunachal Chief Minister Pema Khandu has demanded a separate time zone for northeast India. The Department of Science and Technology(DST) has also recently announced that it is conducting a study to assess the feasibility of having different time zones in the country. The study is being conducted to give scientific inputs on the matter. Whether this decision was taken at the CM’s request remains to be seen. According to the reports published in various news papers “The DST has been conducting studies on this, looking at what is the potential of energy saving if you have two different time zones”. One can actually save energy because the sunrise and sunset timings are different in the country, but the office timings are one across the nation. The study is also expected to cover the overall impact, especially on the transportation system. Leaders from the northeast region argue that a separate time zone, a long pending demand, would increase daylight savings and efficiency. One of the arguments is that early sunrise means that by the time they start their day, almost half the day has passed. This means an early sunset which requires extra use of lights in both homes, offices and public places, hampering the productivity.